The N-225 captures some classic Gibson design elements, and actually, we quite like the looks - even if, like the tones, they won't please everyone. Interesting tone selection. Not another Les Paul! Looks will divide opinion. Jack of all trades, but master of none. We know what you're thinking: what the hell is this? Well, 'this' is the Gibson N-225: a mongrel that borrows elements from Gibson classics such as the SG, LP double-cut and ES series. 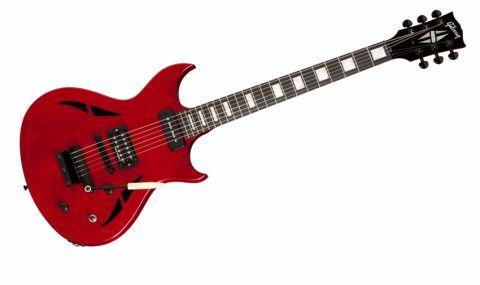 It joins Gibson's product line-up as part of the Designer series - home to other radical designs including the Moderne and Flying V. As such, it'll divide opinion faster than the proverbial yeast-based toast accompaniment. The mash-up of styles doesn't stop with the visuals. The N-225 is loaded with a P-90 in the neck position and a Dirty Fingers humbucker in the bridge. Controlled by a standard three-position toggle switch, the humbucker can be split using the tone pot for single-coil sounds. You also get a Vibrola vibrato, as seen on signature SGs by artists such as Frank Zappa, Angus Young and Robby Krieger. And don't let those f-holes on the N-225's maple body fool you - this is an "open- chambered" design rather than a full-blown semi or hollowbody. As the pickup configuration implies, the N-225 offers pretty diverse tones. The P-90 in the neck sounds great clean, but better when you apply a little dirt for punky rhythm sounds, and it also gets you deep, defined and tonally rich neck pickup tones for single-note riffing. It's a similar story with the Dirty Fingers in the bridge, albeit with more bite. It works particularly well for heavier sounds, without muddying up as much as the P-90. Given the scale length, you'll find that some of the traditional single-coil snap is lost from the coil-split unless you really dig in, but once you do, you'll find it surprisingly authentic. "Overall, there's a real sense of clarity from the N-225"
Overall, there's a real sense of clarity from the N-225: the pickups sound powerful yet dynamic, and the individual notes are audible, even under plenty of gain. In addition, the chambered body and f-holes help to create resonant feedback when needed. Yet we can't figure out who this guitar is for. It's too modern for retro-obsessed gear hipsters, too solid for rockabilly freaks, not solid enough for out-and-out metal. The N-225 is a bit of a jack-of-all-trades, accomplishing some great tones very well, but without mastering any. It left us with a slightly indifferent impression overall. And when you're only getting a quid back from £1,000, that's not enough.